Garmin Zumo 550. A great piece of kit. It fits easily on the bike and draws a maximum of 15W which is important when your alternator produces a meager 60W! The unit came with street-level maps that will took me across Europe. A world map to cover main roads for the rest of the journey was relatively cheap. After dabbling with synthetic oil, I used trusty Rock Oil Road 2-stroke oil on my journey. 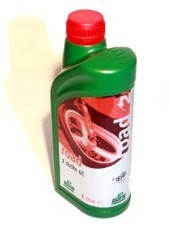 It's a high performance mineral pre-mix oil providing high performance film strength. It was a sad day when I ran out and had to buy marine 2-stroke oils in North Africa. Tuning a carburettor is not my strongest point. I have found the Gunson Colortune kit most valuable. Colortune allows you to see into the combustion chamber of the engine and to adjust the mixture simply by colour. A light blue flame is weak, a yellow flame rich and a bunson burner blue flame spot on. The Grip-Lock securely clamps both the throttle and front brake lever. It's compact, highly visible and easy to use. It's also ideal for a classic bike like the Bantam, which has a drum brake and therefore cannot use a disc lock. It's strong yet lightweight with 3 hardened steel inserts made to destroy hacksaw blades. On my travels I carry a digital camera, mobile phone, laptop and GPS. A quality worldwide travel adapter is essential and the Lindy All-in-one Mains Plug & USB Travel Adapter strikes me as the best. Charging my phone and camera straight from the mains socket via USB without carrying their chargers is a great bonus. Keeping track of your charging system and battery is crucial on an old bike with coil ignition. I used a BSM (Battery Status Monitor) supplied by Paul Goff. The BSM's bright LED changes colour according to the state of your battery, showing critically low, normal, charging and overcharging. An excellent tool. A compass is especially handy whilst navigating with a map, both in cities and on the open road when the sun is hidden. Bike instrument specialists, Formotion make this beautiful compass just for motorcycles. It's easy to calibrate to compensate for interference from the bike too. Paul Goff, a specialist supplier of classic motorcycle electrical parts, has supplied the bulls-eye indicators and relay. These indicators were originally fitted onto the handelbar ends of 1960s BMWs. I have seen them used on the bar ends of many British classics and they look great.